Help me celebrate Banned Books Week! The following is from the American Library Association web page devoted to frequently challenged books. Off the list this year, are two books by author Toni Morrison. The Bluest Eye and Beloved, both challenged for sexual content and offensive language. The site has many other links of interest, including three that caught my eye: Top Ten Challenged Authors 1990 — 2004; Most Challenged Books of the Twentieth Century; and Graphs of Challenges by Initiator, Institution, Type and Year. For an alphabetized list, with links, visit the American Bookseller’s Foundation for Free Expression Online Handbook. What to do? Start by downloading the free ALA brochure on the Most Challenged Books of 2007-08. You can also buy stuff at the ALA Store. More importantly, buy one of these books, if you don’t have it already, and read it–think what you would miss without its ideas in the world. If you have the book already, read it to someone close to you. Check it out from the library and declaim it loudly in the quad. Fahrenheit 451 and 1984 were not just good novels, they were visions. Reading proudly and openly and sharing ideas, especially ones we’re inclined to shy from, keeps those visions in realm of fiction. My latest trip, to Houston representing the Puente Project, got me thinking about the process of getting from one place to another which we call traveling. While Odysseus, Hercules and Jason might have been among the first to complain that traveling has its drawbacks, the modern version is hardly less stressful. 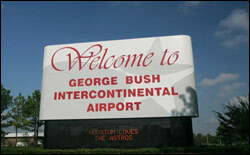 My trip had two legs, a puddle-jump from Fresno to Phoenix and a somewhat larger jump to George Bush Intercontinental. When I bought the tix (through Orbit), I didn’t know it was “George Bush” (its airport code is IAH, still) or I might have reconsidered. 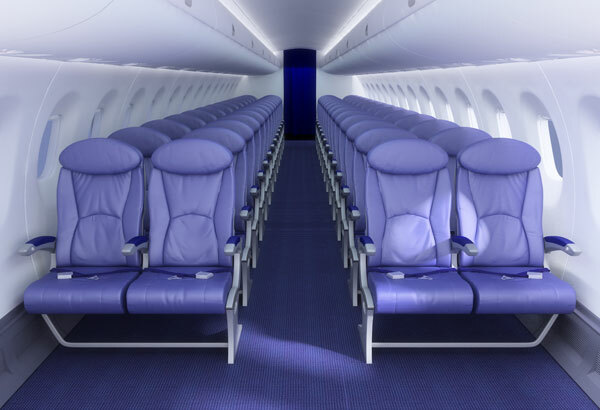 In any case, I was jammed against a window on the first leg and jammed against the aisle on the second leg and it hardly seemed to matter which seat I got as they were all awful. It was just like life in George Bush’s America! But, like anything, awful is a relative term in this case. Physically, the economics of flying favor diminutive people and most of us are not–hence, we are in each other’s space the whole way and getting upset about it makes little sense. On my first leg, I was in the second row of seats (yea! ), but in the first row was a squalling baby flying for the first time. The person next to me apologized for elbowing me, saying something about not being a small woman. For some reason, I was mentally unprepared for flying and I seemed to have packed things haphazardly. I kept having to fish for my mp3 player and my book down in my laptop bag which required certain body contortions better suited to circus performers. My seat neighbor kept trying to engage me in conversation and though I really didn’t feel like talking, I eventually found myself enjoying the company. The young mother in front of us breast-fed her baby most of the trip, which was both quieting and humanizing. I realized (later) that much of my discomfort on the flight was ameliorated by small human actions: personal connection and the seemingly insignificant, but generous acts we make toward each other without thinking about them. The flight attendant had a wry humor as she recited, for what had to be the four bazillionth time, the preflight safety routine. Although I immersed myself as much as possible in my book (Into Thin Air) and music (godspeed you! black emperor), the flight was bearable not because I retreated from the human connection, but because I was drawn to it. Again, I retreated to my book and earbuds and shifted as far as I could toward the aisle. Whenever the girls would scream out, I exchanged sympathetic glances with a woman across the aisle or the young woman in front of me who had to get out of her seat at various times to allow for bathroom trips. I spent the whole trip pretty much avoiding contact with these people next to me–until we landed. Then, as we taxied along the airport (for a long time), the husband asked me about the book I was reading. He’d met Jon Krakauer, the author, who was apparently a friend or relative of a teacher he’d had. The conversation that ensued wiped away all the unpleasant thoughts I’d had and I realized they were as trapped in this travel purgatory as I was, doing the best they could with their children. I read of travel-rage incidents and of drunken people duct-taped to their seats, of rock stars and models arrested and dragged off planes. Travel is, frankly, awful and there is a special level of hell reserved for the designers of passenger aircraft cabins I am sure. Somehow, though, my return trip was easier, even though I had worse seats. I packed better, my bags fit better, and I even had an empty seat next to me for the final leg from Phoenix to Fresno. I’d finished the Krakauer book in Houston and on the return, chuckled my way through a David Sedaris collection, a much more lighthearted read. Was I of a more tolerant mind on the return? More resigned? I don’t know. But I got home and my son recognized me and wife had successfully held off all suitors and if Odysseus asked for no more, who am I to complain? A state appellate court has put a financial cloud over the future of tens of thousands of undocumented California college students, saying a state law that grants them the same heavily subsidized tuition rate that is given to resident students is in conflict with federal law. Potentially, this ruling could have serious effects on students in California’s community colleges, COS included. I find the debate over immigration depends almost entirely on whether or not people have been able to connect, one on one, with the subjects of the issue. The undocumented students in my class–the ones I’ve known about–invariably are among the highest acheivers and hardest workers. One might, at first glance, think these young people embody the American ethic of tomorrow. And I propose that they do. There is no question that the subject of undocumented immigrants is complex and emotional. However, what appalls me is the lack of real leadership in tackling the question. Neither the Obama nor the McCain platforms take a stand for human rights and humanity at the border–mostly both platforms parrot the concerns of the people who respond to opinion polls. There is little originality and little difference between the stances (although either would be preferable to what there is now). At least Obama mentions we should “promote economic development in Mexico to decrease illegal immigration,” but the platform has no structure or focus. In the absence of official leadership, it is time once again to create our own. Slowly, we have allowed our rights to be eroded by fear and by threat, we have allowed our economy to benefit the very wealthy at the expense of the poor and the (fading) middle class, and we have allowed our voices to be usurped by a loud minority. It is time to think again about what it means to be human in this world, to reconnect to the things we have in common as citizens and non-citizens alike, and to imagine: What course of action will bring about a future that will benefit the most people for the most sustainable period of time? In short, it’s time for vision. Read the complete text of the Chronicle article and check out some of the AB 540 links on the COS Puente web site. Check out this amazing collection of early 20th century American Legion posters. During the first half of the 20th century, print and paper were an effective way to convey ideas and information to the citizenry. During the years of the first and the second world wars, posters carried many messages. The American Legion’s collection of World War I and II posters is truly outstanding. These posters are in fine shape and download in large, detailed sizes. In context, as well as in stand-alone pieces, the collection is a slice of American life and culture, the harbinger of more sophisticated government propaganda (albeit with the same simple messages), and a library of memorable pop culture art. McCain picked the wrong Palin! Visit Michael Palin for President!